Do you need to create more engagement and increase sales? Who doesn’t?! Let’s do launch! You know you have incredible gifts to share with the world. Sure, you list your products and services on your website. You mention your offers in your newsletter and you share them on social media. But do you find yourself scratching your head when you don’t get the sales you’d hoped for? I hear time and time again from creative souls just like you who are frustrated that they’re not getting the results they want or they’re overwhelmed by what they should focus on. Here’s the cool thing… I bet there are some simple shifts and do-able actions you can take NOW to help bring more visibility to your work and more consistent engagement and sales. This isn’t about a step-by-step formula or swipe emails that sound like every other email in your in-box. This is about bringing your authentic self to your promotions and bringing your peeps on a journey to help them decide if your offer is the right fit for them or not. 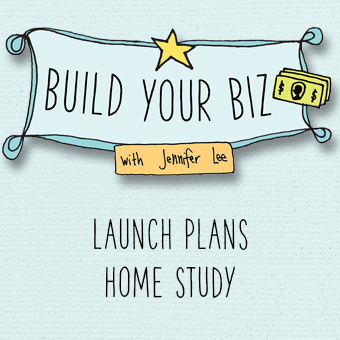 I can’t wait to show you how in the Build Your Biz: Launch Plans Home Study! Plus get a special bonus gift! A recording of a 60-minute live interactive group session with Jenn. You’ll learn how to apply concepts from the Build Your Biz modules as you listen to Jenn laser coach participants and provide feedback, guidance, and accountability. “During my time in the mentorship program I launched the 3rd edition of the printed Daily Musings Journal with a 50% increase in the quantity that I ordered (to put out into the world). And they sold out!! Want the entire suite of Build Your Biz modules? “Jenn helped me to make sure … that I was breaking down the launch process into smaller steps, getting organised with my marketing as well as getting over the fear of marketing (especially as an introvert), how to reach out to people, and lots of clever tips to make my offerings more attractive throughout the whole process. What’s the format of the Build Your Biz Home Study? Since the course is done at your own pace, there is no formal facilitation and you’ll have instant, life-time access to all of the materials once you register. That means you can start right away, or you can refer to the module(s) at your leisure. Please note that the video recording was originally part of a facilitated group program so there may be references to a chat or online group that are not part of this home study version. All of the materials you need are provided in your module. A computer, reliable Internet access, the ability to watch online videos and view PDFs. A color printer is optional to print out the illustrated play sheets. Optional/recommended: A copy of Jenn’s second book Building Your Business the Right-Brain Way. While the book is not required to participate in this course, we may periodically reference it to simply encourage further insight. Once you register for the course, you’ll get sent a coupon to receive 20% off a signed copy when purchased directly through Jenn. Is this module suitable for newer business owners or people who’ve been running their business for awhile? The concepts covered in this course apply to both newbies and seasoned entrepreneurs. If you’re just starting out in your business, the concept of launch plans may feel a bit more advanced or even intimidating. Launch plans require that you have a solid understanding of what you’re offering who your audience is and an existing relationship with your right peeps. But that doesn’t mean that as a newbie you can’t benefit from learning the launch plan concepts now. In fact, by starting early you can set yourself up for success in the long run. If you’ve been in business for awhile but are still having trouble reaching your sales goals, filling your programs, and/or you’re resistant to marketing, chances are you’ve been leaving hundreds if not thousands of dollars on the table by not having consistent communications and follow-through. You’ll be surprised how having just a little bit of structure can help you close the deal with prospective customers who’ve been on the fence. Don’t worry, my right-brain, visual style makes creating launch plans fun and empowering. How is this Launch Plan module different from your other courses? The Launch Plan Home Study module is part of the Build Your Biz suite of modules. These Build Your Biz Home Study modules are a good fit for creatives looking to grow an existing business. You already have a sense of what your business is and who you serve but you’re struggling with making sales, you’re uncomfortable marketing yourself, you’re frustrated with your finances, you’ve been stuck in the same place for awhile or you’re burnt out from doing too much. The Launch Plan module specifically helps you with creating targeted, time-bound promotions to build awareness, generate excitement, invite action, and increase sales. If you’re brand new to your business, the Right-Brain Business Plan® Home Study is a good place start because it will help you lay the foundation. Then you can dive into the Build Your Biz Home Study modules once you have a sense of your overall business. 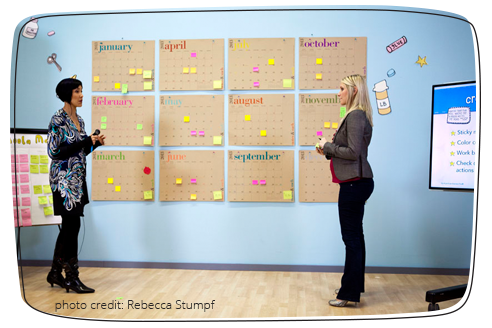 The Right-Brain Business Plan® Home Study helps you get your business plan done in a creative and visual way. You’ll get clear on your big vision, your perfect customers, your general marketing plan, high-level financial goals, and more. The Product Development Playground Home Study helps you turn your special gifts, teachings, and know-how into tangible or digital products like an e-Book, e-Course, audio or video series, program, summit, kit, or other creative product so you can impact more people around the world, in less time, and make more money. The Product Development course specially covers taking an idea from concept, prototyping, testing, producing, and launching. There is some slight overlap with the launch section of the Product Development Playground but this Build Your Biz Launch Plan module goes much more in-depth with several examples of entire launch plans (including actual email copy and timing), how to evaluate a launch, and more so even if you have the Product Development course, this module will provide more advanced support. The course registration fee is non refundable. Before you sign-up, please make sure you’re fully committed to participating in and completing the course (remember it’s self-paced so you can refer to the materials at your leisure). If you need more information to help you make a solid decision, contact us with your questions. We are more than happy to answer any other questions you may have. Please contact us at info @ artizencoaching.com and someone from the team will be in touch. Thanks for your interest. Jennifer Lee, CPCC, PCC, MA, is the founder of Artizen Coaching® and the author of Building Your Business the Right-Brain Way and the bestseller The Right-Brain Business Plan, which has helped tens of thousands of entrepreneurs around the world launch their creative businesses. After spending 10 years climbing the corporate ladder and getting tired of living her dream "on-the-side," she took the leap to pursue her passions full-time. Jennifer has been featured in The Wall Street Journal, U.S. News & World Report, Entrepreneur, Whole Living, Family Circle, Cloth Paper Scissors Studios, and Choice magazines, numerous radio shows, and on ABC7 TV and partnered with Levenger to develop the Right-Brain Business Plan® Circa® Notebook. She received her coaching certification and leadership training through the prestigious Coaches Training Institute. Jennifer is also a certified yoga instructor, a certified Expressive Arts Facilitator, a certified meditation instructor, and holds a B.A. in Communication Studies from UCLA and an M.A. in Communication Management from USC. She lives in the San Francisco Bay Area with her creative, rather left-brain husband, and their sweet husky-lab mix.